Details at the end of this post on how to enter to win a surprise gift bag from the author. We also have a link to purchase Poisoned Pages from Amazon, and an indie bookstore where a portion of the sale goes to help support KRL. Following the trial and conviction of the man responsible for her husband’s murder, Tricia Miles is finally feeling ready to move on with her life. Spurred on by more than a little nudging from her sister Angelica, Tricia is running to replace her sibling as the president of the Stoneham Chamber of Commerce. The owner of vintage mystery bookstore Haven’t Got a Clue, Tricia loves her book-themed town and has its best interests at heart; very much unlike her opponents, who enter the fray solely out of spite and to prevent Tricia from winning. Stoneham Weekly News owner and reporter Russ Smith is an unhappily married former suitor, while travel book store owner Chauncey Porter blames Tricia for the death of his fiancé. As the campaign looks to be as ugly as Presidential race can become, local stores are plagued by vandalism and minor – but very irritating – pranks. Even more concerning are the blackmail threats being made against Angelica, who is refusing to disclose even to Tricia what secret is worth paying to keep hidden. Considering that she is one of the few aware that Angelica is the secret developer assisting local businesses, Tricia can’t imagine what her sister could be ashamed to reveal. What Tricia learns is that past crimes continue to intrude on the present, and if the sisters aren’t willing to finally open up and risk all, the charming lives they’ve built could all come crashing down. This is a novel of secrets and lies. That the mistruths and deceptions have been going on between loved ones is tragic, and yet understandable as they are the ones whom we never want to disappoint. There is a little commentary on the state of women in politics, especially when the campaign turns truly ugly. Tricia has a rather impressive record of vengeful exes, but the one who may finally be her best match proves to be the most surprising of all. Stoneham is a town every book lover would dream of calling home, but it is still populated by very human tragedies and struggles. What I love so much about this series is how both Tricia and Angelica have grown as characters, building a bond between them that is supportive and yet still vulnerable to insecurities. The Booktown of New Hampshire may have its share of flawed villains and nosy gossipers, but overshadowing all is the genial good humor and warmth of these delightful Stoneham characters. To enter to win a surprise gift bag from the author, simply email KRL at krlcontests@gmail[dot]com by replacing the [dot] with a period, and with the subject line “surprise,” or comment on this article. A winner will be chosen August 11, 2018. U.S. residents only. If entering via email please include your mailing address (so if you win we can get the book sent right out to you), and if via comment please include your email address. You can read our privacy statement here if you like. I love this series. Thanks for the contest. I have read the previous Booktown mysteries and enjoy very much. Wish their actually was such a place to visit. 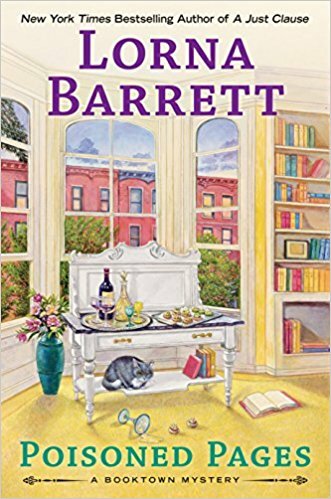 Lorna Barrett is an amazing author and a neighbor who lives “mumble, mumble” counties upstate from me. I love her books in all their iterations. I’d also be thrilled to win this book for my home library. A favorite author giving away a surprise gift bag – please count me in! Haven’t started this series, yet. I love the Booktown series. Adding this to my must read this summer list. would love to wind this book, looks so good by the way the cover is fabulous. Thank you so much for the opportunity. I love books they are my getaway. Oh, this book sound great! I haven’t started this series, even though it is on my TBR list and I have several of the books in the series. Thanks for the great review and the giveaway! Great series! Would love to read “Poisoned Pages”. Thanks for the chance.